Disclaimer: I dont own these characters and I make no profit from this. I write purely for fun. When Chris entered the saloon he went straight for the bar. He ignored the heads that turned away and the soft muttering behind his back. He ignored the fast shuffling with which everyone made sure they got out of his path. He didn't look Inez in the eye when she pushed a shot glass of whiskey over. She said something, but he didn't listen and very soon she moved away. Good. Last thing he needed right now was talk. His right hand shot forward and grabbed the full glass of whiskey. When his fingers surrounded the glass he looked at them, at that hand. His hands never trembled. Not now, not a few minutes ago. Never. He was glad Vin said nothing when he glided over and leaned against the bar beside him, looking back into the saloon, fingers looped into his belt. Keeping watch, keeping his back safe. Looking into the mirror behind the bar he saw his other friends sit at various places in the saloon, looking deceptively relaxed but missing nothing. He could let go now if he wanted. He'd still be safe, he knew. Only he never did let go, ever. Not even after a full bottle of whiskey. He was never too drunk to be able to watch out for his own back. Never too far gone to shoot and kill. Carefully, slowly Chris lifted the glass, stared at it, stared at his hand, at the red on his knuckles still there from a bar fight two days ago. He'd plunged his fist into many faces that night. He'd plunged that fist into more faces than he would ever be able to remember and he didn't care about that. But that kid out on the street would be one in a line of faces he never forgot. "You alright?" Vin asked, softly. Chris didn't answer. Off course he was alright. He was standing here, wasn't he? Drinking a glass of whiskey. Well, holding a glass of whiskey. Holding it with more force than he'd held his knife that morning to finish a wooden bear he'd been whittling for Billy. And with a lot more force than he held his gun. Chris sighed. "Seems they get younger every time," he said softly, not really talking to Vin but to himself. "Awfully young." "Kid was old enough to have murdered. Didn't git his picture on a wanted poster fer nothing, Chris." "Yeah, well, this kid got a rep and ya know it." Yes, he did. Didn't change the fact it was still a kid. Fast, a damn fast kid, one of the fastest he'd ever faced. But not fast enough, not even close. They never were. He kept looking at his hand. No blood on it. Somehow he felt there should be blood on it. That it wasn't right a kid was lying dead in the street and he didn't even have blood on the hand that had done it. The glass started to break when suddenly Vin snatched it away from him before it could come apart and cut his hand. "Damn, Chris! 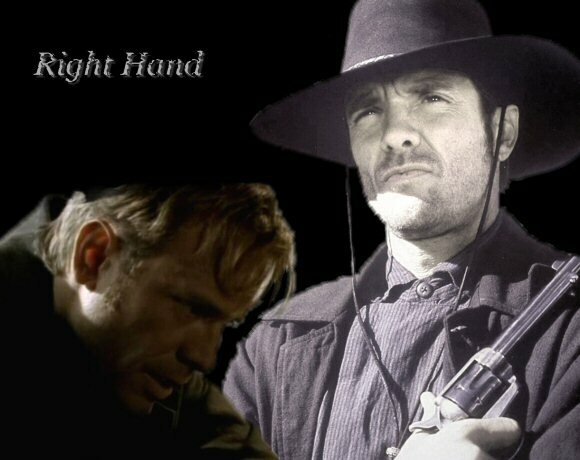 You be careful of yer hand, it's yer gunhand!" Finally Chris looked at his friend. He saw the concern there. Stupid. He never lost a gunfight, he didn't think he could lose a gunfight. And sometimes he was very tired of that. Like now. "That hand saved my life only a couple a days ago, Cowboy," Vin said softly. "Wasn't the first time it did that. So I'd 'preciate it if ya took good care of it." Looking back into the saloon, Vin added, "And I think Nate would be to, and Mary, and Billy certainly. Ya want me ta name a few others that hand saved?" "Nope." Chris pushed himself upright and signaled Inez. "Want a drink." "Yeah," Vin sighed. "Me too. Had a tough few minutes a little while ago. Was afraid I was gonna lose a friend." That made Chris grin. "Really? I didn't." A few glasses would be good. Just a few, and then patrol. He knew Vin would come along, which would be good, too. And maybe, just maybe, he would be left alone for awhile when people heard about this time, this gunfight. These days he did hope again.